This might be self explanatory. It's a weather table. 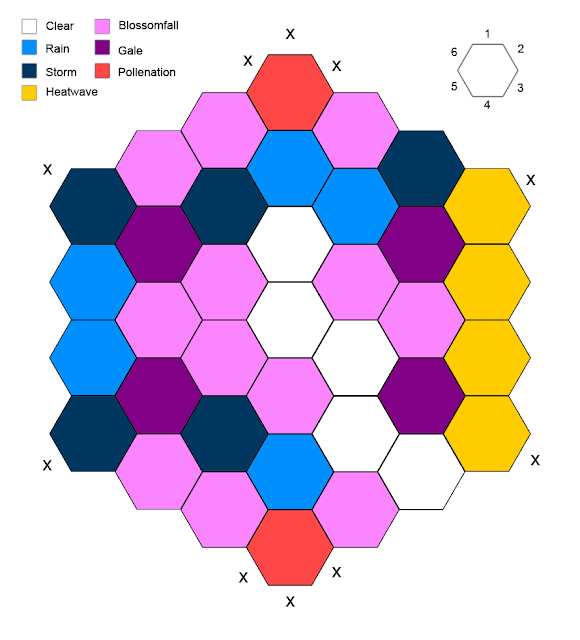 You pick a starting spot and move through it randomly to generate the weather day by day. In the above example the weather started in the middle, on a clear day. The GM or whoever rolls a D6 to determine how the weather changes. In the above example they started at the black spot and rolled, in order, 1, 1, 6, 4, 3, 3, 4, causing their week to be clear, then rainy, then covered in blossoms, then stormy, then clear, blossoms again, and finally clear. The weather here is tumultuous but, thanks to the table, is still predictable to a certain degree. If the players stay in a specific location (and experiences its specific weather table) for long enough they will gain an intuitive feel for the weather. They'll feel their way through its topography, possibly be suspicious of a coming pollination if rain follows a blossomfall. What the weather does isn't important, and should be changed by the region. You could perhaps change it by season, but a large enough weather map could generate the rough feeling of changing seasons as long as you don't mind some randomness to its passing. The players will know that if they're in the middle of a draught that it's going to be a long time to the rainy season and they are unlikely to see a pollination. A larger table can be more subtle, less changeable. However note that even this small table would take a week to go from rainy to dry season. As for the edges: when you bump up against an edge you slide along it or stay put, depending on how the table is made. In this case I've marked dead ends with Xs, where if you bump up against them you just stay in that season. Pollination can last for a while, they take as long as they need. If there is no X (or a clear dead end with no angular preference), then slide in the direction indicated as closely as possible. This means that seasons on the edges have a tendency to "stick". I've been sketching these in my hex books. do you have any broad suggestions on how to make these flow naturally?like, I want to make one, but I feel I'll make it to much of a gradient, and it won't be very exciting. Start by painting in the key weather types you want to see on the 6 corners, since they will be the most likely destinations, then make a muddled patchwork of less extreme sorts between them. Make sure no weather type is completely surrounded by identical tiles unless you want extremely reliable weather, but also consider at least pairing all of them (or somehow ensuring they can repeat, like putting them in the corners) so that you have the possibility of extended periods of specific weather events..
Also remember that you are as likely to backtrack on yourself as you are to go anywhere else. This means you could get stuck bouncing between two tiles for days at a time. With that in mind you can get away with being pretty wild with the connections. As long as the transition between all neighbouring tiles is at least somewhat believable then the whole thing should hang together well enough. Friggin work genius here. It's a great way to have weather that feels like weather. This is really great work! Some people over on Google+ are talking about using it for encounter mapping, which I think is a fantastic idea. If I were to retool this and credit you with the concept would you allow me to use it in a publication (I write a Dungeon World zine called Session Zero)? Please feel free to do whatever you like with it. Thanks! If I do end up using it in my publication I'll credit you and link to your blog. Have you run any simulations? I feel like the central squares would occur more often, not the corners. That's how most random walks work, anyway. I'm only going off limited experience, so you could be right. From using it in play I feel it slips up and down the sides more than it traverses the centre. Maybe it happens because they dead-end rather than bounce off?